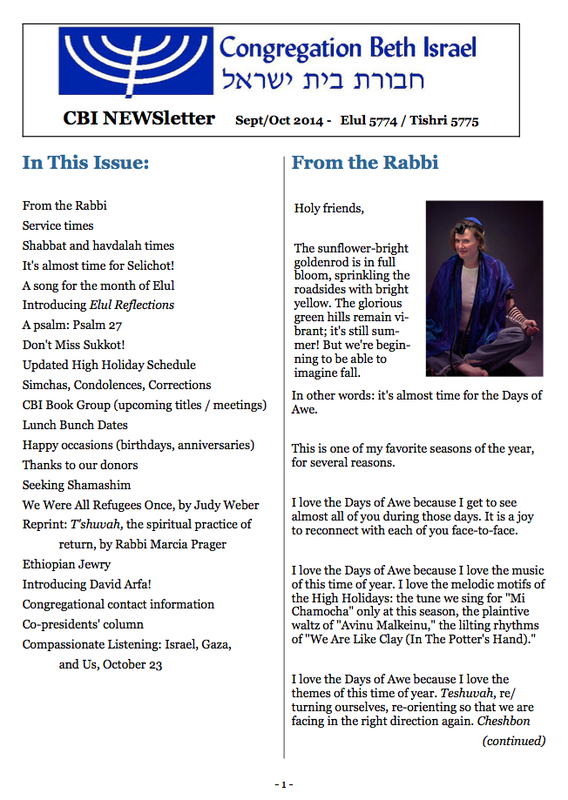 The Elul 5774 / Tishri 5775 (September-October 2014) newsletter is here! In this issue you’ll find the From the Rabbi column; Service times; Shabbat and havdalah times for the next few months; It’s almost time for Selichot! ; A song for the month of Elul; Introducing Elul Reflections; Reb Zalman’s translation of Psalm 27; Don’t Miss Sukkot! ; Updated High Holiday Schedule; Simchas, Condolences, Corrections; CBI Book Group (upcoming titles / meetings); Lunch Bunch Dates; Happy occasions (birthdays, anniversaries); Thanks to our donors; Seeking Shamashim; We Were All Refugees Once, by Judy Weber; Reprint: T’shuvah, the spiritual practice of return, by Rabbi Marcia Prager; Ethiopian Jewry; Introducing David Arfa! ; congregational contact information; the Co-presidents’ column; and information about a program called Compassionate Listening: Israel, Gaza, and Us, October 23. Those who are on our email list will receive a digital copy via e-mail shortly. Those who don’t have access to email, or who have specifically requested paper delivery, will receive a paper copy in the mail next week when our office administrator has returned from his richly-deserved vacation. Many thanks to everyone who responded to our survey about our Friday morning meditation minyan. The survey results showed a clear preference for 9am as a start time, so starting this Friday, we will convene at 9am instead of 8:15. My apologies to those who had other preferences; I know that no time of day is perfect for everyone. 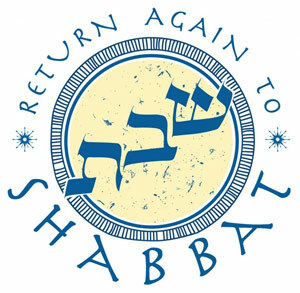 I am delighted to learn that in addition to our regular practices of following the breath and preparing ourselves spiritually for Shabbat, several people are interested in walking meditation (once we create the planned meditation labyrinth on the CBI grounds), in Jewish chant and mantra practices, and in practices for cultivating compassion. The survey results also revealed an interesting difference of perspective about our meditation minyan. Some of our non-Jewish participants would like for the group to be broadened into an explicitly ecumenical meditation experience, with teachings rooted in a variety of faith-traditions and not just in Jewish thought and practice. Others (both Jews and non-Jews) seem happy with the kind of Jewishly-oriented teachings which I’ve been offering, and which Rabbi Jeff offered in previous years. I love the fact that our meditation sessions are attended by people of many faiths, and I am committed to principles of post-triumphalism (no faith is “the only right way”) and deep ecumenism (we can and should learn from one another’s faith-traditions and practices.) And, it’s important to me as the only rabbi in north county to ensure that programming is offered which can help members of the local Jewish community prepare for Shabbat and festivals in a heart-centered way. After conversations with a few different people here at CBI, I’ve come to the conclusion that the teachings I offer at our meditation minyan should continue to be rooted in Jewish thought and practice. The meditation minyan is a service which I offer to our community, and it’s important that I offer it even if only a few people are taking advantage of it. We continue to welcome friends of all faiths to join us in our meditation minyan if our practices and teachings hold meaning for you or if sitting in silence in our sanctuary appeals to you. And if there is community interest in an explicitly interfaith / ecumenical meditation group in addition to the 9am Jewishly-oriented meditation minyan, I’m certainly open to CBI hosting such a group in our sanctuary. If someone would like to take that idea and run with it, let me know and I’ll do what I can to facilitate its happening at CBI. The other piece of feedback I’ve received is that it’s frustrating that sometimes life circumstances obligate me to cancel our meditation minyan for a week or for a few weeks at a time. I hear your frustration and I honor it. One of the challenges of serving this community as a half-time rabbi is I sometimes have to shift my work days in a way which precludes my presence here on Friday mornings. I know that that is not ideal. I can offer a new policy which I hope will be a small help in those circumstances. Our office administrator Jack Hockridge arrives at CBI every morning at 10am. On Fridays when I am not able to be at CBI, meditators are welcome to convene at 10am instead of 9am. Jack can open the building, and you are welcome to meditate in our sanctuary together without me. If there is a week when you intend to take advantage of this, please let Jack know in advance by emailing office at cbiweb dot org. Thank you all for your input and for being part of our community. Shavua tov / a (slightly belated) good week to you! This Shabbat, our shaliach tzibbur (prayer leader) for morning services will be Rabbi Pam Wax. We extend a hearty thank you in advance to this week’s service hosts. If you would like to join the shamashim (“helpers”) who welcome people to our Shabbat services and who host our light kiddush afterwards, contact Pattie Lipman. We also extend thanks to our member Helene Armet for the beautiful home-baked challah! We hope to see you soon at CBI. Have a great week! On Tuesday evening, August 26th, we’ll enter into the new lunar month of Elul. Elul is a very special time on the Jewish calendar; it is the final month of the old year, and it’s our time for the spiritual “ramp-up” process which will prepare us for the Days of Awe. In Hebrew, the name Elul is spelled אלול. These four letters can be read as an acronym for the phrase Ani L’dodi V’dodi Li, “I am my beloved’s and my beloved is mine.” That’s a quote from Song of Songs. In this context, the Beloved is God. Elul is the month when we remember that our relationship with God is quintessentially a relationship of love. Jewish tradition teaches that during Elul, “the King is walking in the fields.” This is the month when God departs from the divine palace and wanders in the meadows, among God’s people. In this metaphor, it’s presumed that during most of the year God may be difficult to access (like an earthly king in his palace, protected by guards and by layers of beaurocracy) but during this month, God is right here with us, all of the trappings of royalty discarded, ready to listen to us as a friend listens to another beloved friend. What would it feel like to wander in the beautiful fields (perhaps right here behind our synagogue sanctuary) and speak quietly with God, knowing that God is listening with compassion and with love? This is the month when we deepen our practice of teshuvah, repentance or return. Teshuvah is the spiritual work of looking closely at our actions and emotions, our thoughts and our souls, and discerning where we’ve missed the mark and how we could do better. Some sages teach that the month of Elul is the time to apologize and repair our relationships with other human beings, so that during the Ten Days of Teshuvah (between Rosh Hashanah and Yom Kippur) we can focus on repairing our relationship with our Source. There’s a custom of blowing the shofar every day during the month of Elul. The shofar is a kind of spiritual alarm clock; when we hear it, it’s meant to wake us up! If you’re not able to blow shofar (it’s not among my skills, for sure), you can listen to someone else blow it. If you’re looking for materials to help get you “in the mood” for teshuvah, for self-reflection, and for the coming Days of Awe, I always recommend Rabbi Alan Lew’s This Is Real And You Are Completely Unprepared: The Days of Awe as a Journey of Transformation. And/or, feel free to borrow or buy a copy of Elul Reflections, a paperback collection of the Elul meditations I wrote last year during this holy month. (I have several copies in my office, and if I’m not here when you drop by, there are also copies on the bookshelf right outside my office door, with a little sign indicating that you can help yourself to a copy.) I have six copies to lend out; if you want to buy one, they cost $8 in person or on Amazon. One final Elul custom is reading psalm 27 every day. There’s a gorgeous translation of the psalm in Psalms In A Translation for Praying, by Rabbi Zalman Schachter-Shalomi z”l (may his memory be a blessing.) And/or, you can hear or sing Achat Sha’alti, an excerpt from that psalm — “One thing I ask of You, I earnestly pray for — that I might dwell in Your house all the days of my life, knowing the beauty of You, and dwelling in Your holy place.” What does it mean to dwell in God’s house? Maybe it means recognizing that wherever we are, that place can be a holy place, a place where the divine presence can dwell, if we only open our hearts. Kein yehi ratzon — may it be so! This Shabbat, our shaliach tzibbur (prayer leader) for morning services will be Rabbi Rachel, and we will celebrate Cole Filson as he is called to the Torah as a bar mitzvah. Rabba Haviva Ner-David is an author, pioneer in Jewish women’s post-denominational thinking, wife, and mother of seven living on Kibbutz Hanaton. 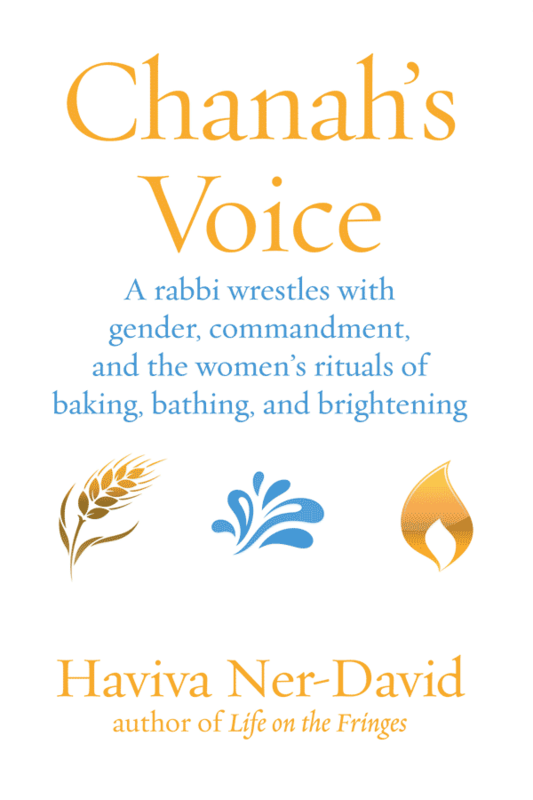 She is also a dynamic speaker coming to share the experiences and thinking which led to her latest book: Chana’s Voice: A Rabbi Wrestles with Gender, Commandment, and the Women’s Rituals of Baking, Bathing and Brightening (new from Ben Yehuda Press). All genders are invited to join us for a talk followed by light refreshments and an opportunity to chat with the author and get books autographed. Here is the translation of the haftarah for Shabbat Hazon (“The Shabbat of Vision,” the special Shabbat immediately before Tisha b’Av) which we read and discussed at CBI today. It was translated by ALEPH rabbinic student David Aladjem. Of Judah and Jerusalem reborn. But – oh how quickly – we forget. Even when we could heal the world. And what do we reap from our lust for evil? A bruised body, heart and soul. Burning up through our desire for more, ever more. Yet we ask, why have You forsaken us? Yet You do not answer us. And that which puffs you up with pride. And love for your souls. And all will dwell within her walls in peace. And war and destruction will never come again.